These beautiful cards (right) for your church visitors are absolutely free - no charge or fee to download and print for your church visitors 24 hours a day 7 days a week. 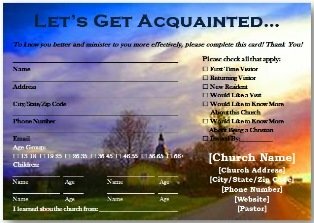 I'm paying-it-forward and giving these cards away to any church whether they are small or large. If your church needs a way to follow up with their visitors then you might need download the cards below. These cards for church visitors play a very huge part in connecting a person into your church. They are about the individual or visitor and not about finding out what marketing efforts are working for your church. Some people call these "Church Welcome Cards" or "Connection Cards" but no matter what you call your cards just be absolutely sure you are connecting with your church visitor and giving them an opportunity to easily connect with your Pastor, etc. You can add notes to your cards that you might have already such as "Thank you for joining us in worship. You are always welcome." You add scriptures to your cards such as Psalm 84:4 (KJV) - "Blessed are they that dwell in thy house: they will be still praising thee. Selah." Connect with your church visitors before they leave your church service and give them one of these cards and encourage them to fill out the card and leave it with you and to come back and visit soon. If you show your church visitors love and support, letting them know that you do care, and make sure they feel welcome then they just might come back to your church and visit again or might even become a church member. Return to the Church Visitor Information Page.